Info "‘Welcome to Behemoth Burger! Your order might take a while, but it’s worth it! It’s better when it’s fresh, so grab it as soon as it’s done!’"
Fresh off the Grill is Ashley's Boss Microgame in WarioWare: Smooth Moves. The player has to wait until the burger being prepared is done. Several ingredients will be thrown onto it, and the player has to grab it immediately once the finishing bun appears. Various ingredients may include an entire fish or even a Wii Remote. If the player loses, rats destroy the burger. If the player picks it up at the wrong time, an employee takes the unfinished burger. 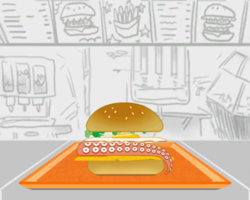 1st level difficulty: The burger will be made normally. 2nd level difficulty: Ingredients may be thrown right over the burger to distract the player. 3rd level difficulty: In addition to ingredients flying across the screen, people will walk across to distract the player. This page was last edited on February 20, 2018, at 01:07.